@Andreas_Hegenberg, this bug is happening very often... I’d really appreciate the suggested fix over at the bug report! I think outlook has a native touchbar set already? Oopsie I've missed your reply! .. Yeah, it happens when you open an application with default touchbar preset like "preview app". When you open it and then close it, touchbar seems to be blocked on default preset and Aqua doesn't come back until you restart BTT app. P.S. I don't know if I've been a little more exhaustive but if you need I can reproduce this bug and record it! ..
Just got usage permission for the Visual Window Snapping function! It'll be here to stay now. Just came across this and this looks amazing. Great work! in v3.0.1 the quick menu has been transformed and merged entirely into the Control Strip. I'm sorry for the late reply but I would test B.3.0.1 a little more! This just seems to be that old bug where the macOS control strip shows up where it's not meant to. I've heard a fix is coming soon. It will be in the next version which will be released by the end of next week! 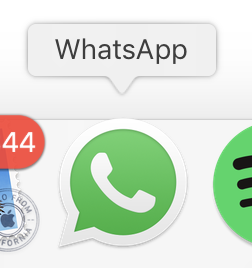 WhatsApp is definitely an AQT bug. I'll look in to that one. Additionally, what is the name (case sensitive) of the WhatsApp you're using? (the dock icon name) EDIT: i've fixed the issue. update is coming soon with all the other latest improvements i've been working on. Safari is designed to automatically close for most websites, so you can use it's native TouchBar set. 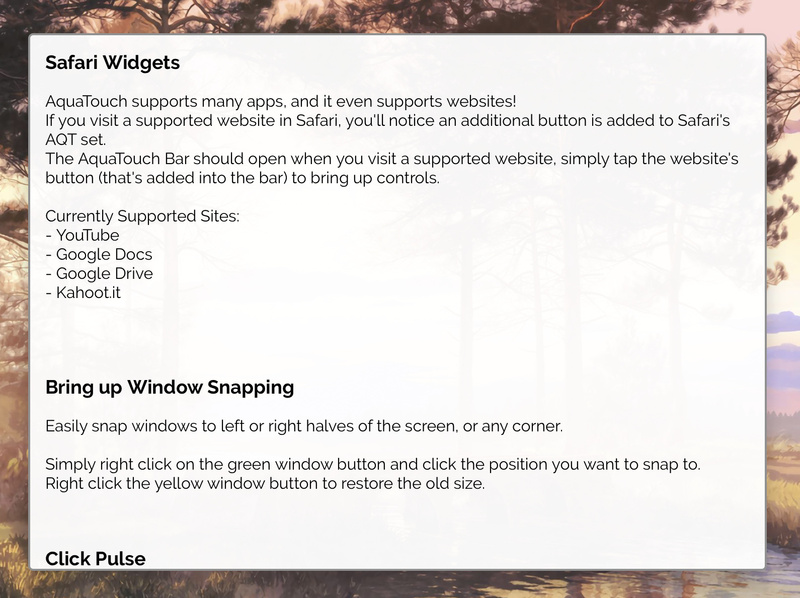 If an SFWidget is supported, it will open and show the widget. Does the behaviour you observe roughly match this design? Good point, Thanks for your reply! If that's the case then maybe i'll consider copying apple's safari implementation / redoing it completely before I change it from an 'extension' set to a 'full' set. I still use safari's native set quite a lot. (the text completing, tab display, bookmarks display, media scrubber, etc.) I'll need to think about that one. Just posted a new feature request, vote up to get it to happen! Add the ability to swipe in from the left or right edge to slide in an overlay with buttons. It'll be like the Trackpad Notification Center gesture, except it slides in an overlay with a few more buttons from the edge of the TouchBar, with the existing buttons dimming. If you set it to 'open group with name', this happens: [example] Otherwise if you set it to, say play/pause, it just does it with no visuals. Download this update in the top post! This will set various variables required to ensure the new scripted triggers work properly. The implementation of the settings and conversion of many triggers into applescript widgets may increase processor stress, lag and battery drain. This is a beta and i'll need feedback about this to ensure that it's tamed enough for the full release. I'll look into making the web browsers into 'full-type' sets instead of extensions, intergrating some triggers from @onaforeignshore ! @iAmWaldo has made a great new preset with Netflix web functionality and improved Youtube Scripts. I've gotten permission from him to merge! Is this preset eligible to hop into the #setup-preset-sharing:developer-verified-presets category? I’d love to hop into that! sure, I'll have a deep look at it and then add it. However if possible please upload it to share.folivora.ai, so I can mark it as developer verified. Sure, Main reason I drag-to-upload is because that site used to break the preset. Hope it’s fixed now. I’m falling asleep at the moment though so I’ll do it sometime soon if that’s okay with you. Links have been updated to use share.folivora.ai. GameMode has been patched for b3.0.2 and is now available for download. When you press the control key on safari AQ disappears. 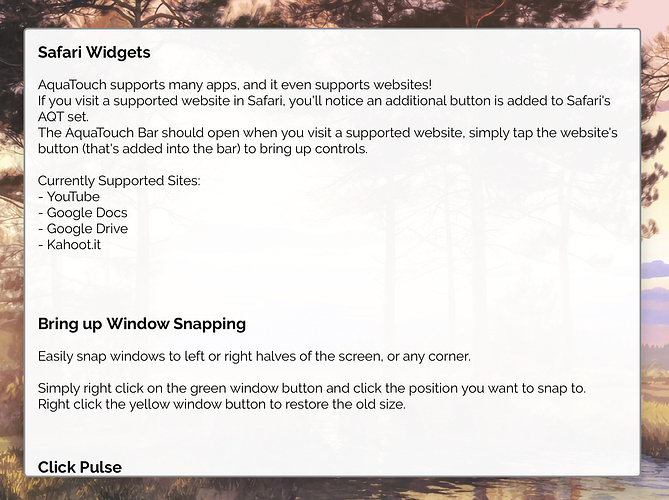 When using BTT via Setapp, the application name is "BetterTouchTool Setapp", which means the setup button in the installation instruction is no visible at all. Strange, for me: DnD does not change icon, but Bluetooth works fine. Will investigate. P.S: I don't personally use word and I think it already has a native set, I might consider this if i've run out of things to make, though, but it's unlikley. I'll get that typo fixed, thanks! Thanks for bringing this issue up. I didn't know that existed so i'll get to fixing it. I have a brief idea of a way to fix the issue but I'll need you to test to confirm that it works, if that's ok with you. When the next update comes around, I'll probably mention you: @pauxus to give you a notification. Thanks everyone for the bug hunting! @Andreas_Hegenberg, I know you're busy, but how's the move to the #setup-preset-sharing:developer-verified-presets category? There is a known issue where the escape button may be misplaced. This is hard and unpredictably controlled as there is no way to set ordering priorities between conditional activation groups. I'll see what I can do. First thanks for the amazing job you have done making the TouchBar more useful and helpful ! So far this is what I have spotted, if I spot anything else, I will post it here. If you need any more precision on the bugs I reported here, feel free to ask ! Another nice thing I would love to see in the future versions of AT is the possibility to navigate in the track (as it's possible on the basic TouchBar made by Apple) when we are into the Spotify Touchbar Menu (or any else Music App).